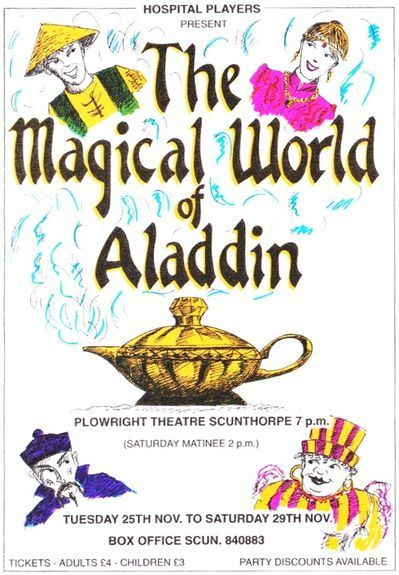 Come and join The Hospital Players for their look at the Magical World of Aladdin. Sit and enjoy as the cast take you on a hilarious romp through the province of Up-Lan-Down and the town of Hi-En-Low in the mystic land of ancient China. Join in the topsy-turvy life of Aladdin and his mother Widow Twankey. How can Wishy Washy cope with his bevy of beautiful admirers The Washettes? Watch while the evil Jaffa schemes to gain the throne from His Majesty, the father of Princess Jasmine, by fair means or foul. Throw in an Oracle of the Ring, a dragon, the scary guardians of the cave and a Genie for good measure. These are the ingredients for a pantomime to enjoy.